Here at Getting Smart, we believe school visits are the best form of professional learning. Based on a couple thousand school visits, and with help from colleagues and readers, we’ve compiled a list of elementary and middle schools that can give educators a better sense of what’s possible. This list includes schools that achieve extraordinary results for underserved communities, create powerful learning experiences, and/or have innovative school models. 2. Ingenuity Prep (@IngenuityPrep) in Washington, D.C is an NGLC winner that serves P-5 students. The culture is positive and purposeful. Ingenuity Prep’s staffing model is built around a teacher career pipeline, providing for at least three highly qualified teachers in each classroom that support blended and personalized learning. 3. Bricolage Academy (@BricolageNOLA) in New Orleans is a new, diverse, active learning elementary (K-4 growing to K-8) school founded by Josh Densen. A recent Mini Maker Faire builds on an innovation culture. 4. Success Academy is redefining success in public education with 25 elementary schools, 12 middle schools and one high school in New York City. Visit to learn about sophisticated teacher development, inspiring science instruction and a powerful culture. 6. Bracken STEAM Academy is an award-winning magnet K-5 school in north Las Vegas. Grade level teams coordinate a long list of digital resources. 7. Cornerstone Madison-Carver Academy is a K-6 school in Detroit. Cornerstone features a lab rotation in primary grades and a class rotation in intermediate grades, and a strong culture and well-developed character development program for all students. 9. Hartland School of Community Learning (profiled here), also west of Milwaukee, is a grade 3-5 multi-age charter school that uses trimester targets to help students set weekly and monthly academic goals for themselves to guide their learning. Each day, students stop, drop and reflect for the last 40 minutes of the day. 10. Hanley Elementary is one of five Aspire Public Schools schools in Memphis. Their proven “College for Certain Model” offers a “rich STEM-focused education, individualized technology-rich learning opportunities, and explicit instruction in computer coding skills.” For the full story read Liz Arney’s book, Go Blended. 11. Quitman Elementary School in Newark, NJ, is making good strides in a tough place by starting with great expectations. 12. Randle Highlands Elementary in Washington DC supports 100% economically disadvantaged students with 90 minutes of blended math instruction and 120 minutes of blended ELA instruction combined with student-led hands-on activities and lots of community partnerships. 13. Lake Forest Elementary School, part of Fulton County in Atlanta, is a high poverty, high mobility, high ELL school. It’s a great example of blended learning, student-centered instruction, personalized professional development (in PLCs), and a great school culture. 14. Roots Elementary in Denver is an innovative primary charter school featuring a quickly paced rotation model in a big multi-age space (featured here). Students build conceptual understanding and benefit from small reading groups. 15. High Tech Elementary (@HighTechElem) is an innovation school in Denver that is part of the Stapleton redevelopment. Housed with DSST Conservatory Green Middle School, High Tech Elementary blends small group instruction with project-based learning around a beautiful set of core values. 16. Rocky Mountain Prep (@RockyMtnPrep) is a growing network of elementary public charter schools in Denver. The RMP Creekside campus serves P-5 students in a class rotation model (featured here). Teacher fellows can earn a Masters in Teaching from Relay while working with a lead teacher. 17. Barack Obama Charter School in Compton is part of the Ingenium network and uses the personalized, standards-based model first developed in Chugach, Alaska (see seven-part series). Teachers serve as coaches in the system where proficiencies as assessed, verified and documented. 18. 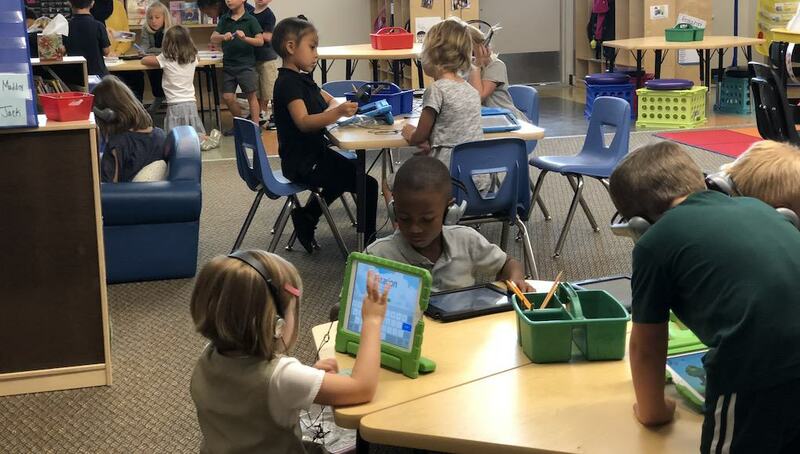 Hawk Ridge Elementary in Charlotte was transformed through the development of a shared vision of personalized learning, a culture of trust, and a lot of professional learning. Key features of the school model include a Genius Hour, personalized pathways, team teaching and opportunity culture staffing (profiled here). 19. Encinitas Union School District, north of San Diego, features nine K-6 schools focused on personalized learning, health and wellness. 20. Herrera Elementary in Houston is an IB school tech magnet that offers dual language. The walls are covered with student work and vibrant with bright colors. There was a blend of individual, partner and group work apparent in every classroom. The kids love the farm animals in the courtyard. 22. Mukilteo Elementary, north of Seattle, makes great use of The Leader in Me program to empower student leadership. They finish each year with a family portfolio picnic where they review quality student work. Students also help to develop a nature preserve with trails and an outdoor classroom (see feature). 23. Rocketship Spark Academy in San Jose is housed in a beautiful building opened in 2013 and authorized by Franklin-McKinley School District. The 19 Rocketship schools combine personalized learning, parent involvement and talent development to unlock potential. 24. EPiC Elementary in Liberty Missouri (north Kansas City) strives to be “an innovative, project-based learning community designed to inspire students to be creative and think big.” Serving 300 learners in the renovated district office, the EPiC architecture features double classrooms and partner teaching. Check out our feature and an iBook that tells their story. 25. KIPP AUSTIN Communidad and KIPP Austin Obras are K-4 dual language schools that feature a station rotation model in Spanish and English. They both promote character development and are part of a high functioning K-12 system. 26. Agnor-Hurt Elementary and Woodbrook Elementary in Albemarle County (Charlottesville) Virginia feature student-centered learning. New inviting multiage spaces provide a variety of configurations and seating options. (See feature and podcast). 27. Shamrock Gardens Elementary is one of 40 Charlotte-Mecklenburg Schools in the Success by Design initiative (supported by Opportunity Culture) that uses new staffing strategies to leverage teacher talent. Success by Design is a key talent development and retention strategy for CMS and it enables schools to meet or exceed School Improvement Plan goals. 28. Napa Junction Elementary serves an economically disadvantaged community south of Napa California with engaging project-based learning. It was one of the first elementary schools to join the New Tech Network (see feature). 29. Cornerstone Academy Preparatory School, San Jose, was high performing elementary school founded in the Building Excellent Schools network that joined forces with Alpha Public Schools in 2016. The K-7 school offers personalized learning and is getting strong results with a high percentage of low income and English learning students. 30. Design39, in Poway Unified School District north of San Diego, is a spectacular K-8 school featuring design thinking and personalized learning (featured here and in a podcast here). 31. West Belden is a K-8 school in Chicago’s Belmont-Cragin neighborhood and part of the Chicago International Charter School network. The NGLC grant winner (see profile) personalizes learning using flexible environments, learner profiles, personalized learning plans and competency-based progress. 32. Cesar E. Chavez Multicultural Academic Center is a neighborhood P-8 in Chicago’s Back of the Yards neighborhood on the south side. Despite nearly 100% poverty and nearly half of the students new to English, the school has been a top academic performer in Chicago for the last five years. Principal (and data ninja) Barton Dassinger was a teacher at Chavez and has kept a veteran staff focused on getting better every year. 34. Aspire ERES Academy serves a low-income Hispanic community in Fruitvale (Southeast) Oakland. It puts all students on a path to a four-year university and is part of Aspire, one of the nation’s highest performing low-income school networks serving 16,600 students in 40 schools. 35. Burley School is a Chicago literature, writing and technology magnet school. Visitors see students discussing, reading, thinking, exploring, questioning, experimenting, creating and collaborating. Students have access to iPads and laptops and a full art and music program. 37. Caliber Beta opened in 2014 in Richmond, California, with personalized learning plans, a flexible rotation model for math and English and project-based learning for science and social studies. Students participate in computer programming, engineering and robotics classes. 39. Magnolia Montessori for All is a champion of both blended learning and the potential of a school dedicated to true college and career readiness for all its students. The school opened its doors as a public charter in the fall of 2014 with grades pre-K through 3. It will reach full capacity in 2019 with students through grade 8. It is a unique blend of Montessori practice and the high expectations of the “no excuses” charter model. 40. Environmental Charter School at Frick Park in Pittsburgh uses their theme to build systems thinkers, explore complexity and develop problem solving skills. 41. Bella Romero Academy is a K-8 school on two campuses in Greeley Colorado. The 6-8 classrooms launched a personalized learning model across all subject areas with support from their platform partner Education Elements. The instructional model looks different in each grade level as the teachers gradually release more responsibility to students each year. 42. Arthur Ashe Charter School in New Orleans is operated by FirstLine Schools. They have a great garden and teaching kitchen. 43. Dolores T Aarons Academy is a P-8 school operated by ReNEW Schools, turnaround specialists in New Orleans. Intermediate blends adaptive software and performance groups in reading and math. Middle grades feature 1:1 Chromebooks and big integrated blocks. 44. Urban Montessori Charter School, an NGLC in Oakland grantee, combines Montessori’s pedagogy with Design Thinking and Arts Integration. 45. Crossroads Academy-Central Street in Kansas City is a K-6 blended and project-based school that embraces the opportunity of an urban setting. 46. St. Ann School, a P-8 school of Archdiocese of New York, is known as The Personal School. They combine personalized learning, character formation, and extended day opportunities to meet the needs of every student. 47. Mandarin Immersion Magnet School in Houston is a must-see with a state-of-the-art facility, cohesive culture, blended learning, and student supports. 48. Gilroy Prep is a high-performing K-8 and the anchor of Navigator Schools. You’ll see a data-driven combination of direct instruction and blended learning. 49. Thrive Public Schools was launched with an NGLC-winning P-6 school that combines project-based, blended and social-emotional learning. The Thrive network serves two low-income east San Diego neighborhoods, and is now P-11. Learn more in this feature and this podcast. 50. St. Louis Language Immersion Schools (@STLGlobalKids) is a K-8 school founded by Rhonda Broussard in 2007 that runs language immersions programs in Chinese, French and Spanish on two campuses. 54. Spurgeon Intermediate School in Santa Ana integrates project-based learning with lab rotation in a newly rebuilt flexible learning space. Lathrop Intermediate is another example of a high-challenge Santa Ana school integrating career education across the curriculum. 55. Advanced Learning Academy is a Santa Ana USD-sponsored lab charter school. It’s a STEM-focused project-based school serving grades 3-10 (featured here). 56. Whittemore Park Middle School was designated in need of improvement, and launched a turnaround process in 2013. This Horry County School (near Myrtle Beach) is a great example of community collaboration and student-centered learning that won an NGLC grant. 57. Achievement First Bushwick Middle School in Brooklyn is blending 90 minutes of math instruction and more than two hours of reading instruction every day. AF Bushwick is home to Empower, an intensive program serving students with disabilities. 58. Piedmont Middle School, a rural school between Atlanta and Birmingham, is an NGLC and Verizon Innovative School winner that has completely restructured their day. The model has three main goals: advanced mastery, relevance and student ownership (read the NGLC profile). 59. KIPP Prize is a 5-8 school in east San Jose featuring personalized learning, character development and cultural enrichment. As one of 14 Bay Area KIPP schools, it was named a Top Bay Area Public School for Underserved Students. (Many of the KIPP schools on our list last year ‘graduated’ to K-12 systems but all remain well worth a visit). 60. Grant-Beacon Middle School is a transformed middle school in Denver featuring blended learning, character development, and extended learning opportunities (featured here). Kepner-Beacon Middle School is the second school in the innovation zone (featured here). Both have great student ambassadors. 61. Fruita Middle School is one of two model professional learning communitiy (PLC) schools in Colorado and a leader in Grand Junction’s District 51 transition to performance-based learning. (See PLC video and podcast with district leaders). 62. Valor Flagship and Voyager are middle schools on the same campus feeding a new high school. Valor Compass is widely considered the best character development program in the country. 64. DSST Byers was the top academic middle school in Denver in 2016. DSST is one of the best high-poverty STEM networks in the country with a culture based on shared values (see feature). 65. Mesita Elementary in El Paso is a dual language P-5 program on two campuses. The Connecting Worlds/Mundos Unidos curriculum is delivered through the integration of dual language immersion methodology and gifted and talented instructional strategies. The program uses a 50/50 design in which students receive half of their instruction in Spanish and half in English in all subject areas. Laila Ferris has been principal at Mesita for 20 years and now leads district-wide dual enrollment programs. The project-based movement began in the Evergreen School District in east San Jose with Katherine Smith Elementary, a joyful project-based school with the best student ambassador program we’ve experienced. 67. AF Greenfield Schools includes Elm City College Prep Elementary, a Connecticut School of Distinction and Elm City College Prep Middle. They are piloting the Cortex platform, and student-centered and technology-enhanced learning. 69. DC Prep is a network of high performing P-8 schools in Washington DC focused on rigorous academics and character development. 70. SPARK Schools in Johannesburg and Cape Town South Africa feature blended and extended learning, design thinking (featured here), and teaching core values (featured here). Deutsch-Französisches Gymnasium/Lycée Franco-Allemand in Freiburg, an interesting experiment in advancing international peace among former enemies (from Bruce William Smith). Saunalahti School in Espoo, Finland, features student-centered learning in drama, art, music, literature, handicrafts, dance and P.E. We’re sure we missed hundreds of great schools. Who did we miss? Share in the comments section below, and don’t forget to check out our other recent Smart Lists at our Smart List Series Page. Is there a resource you would add to the list? Share in the comments section below, and check out our other recent Smart Lists at our Smart List Series. This Smart List was developed by Getting Smart, who helps schools, districts, and impact-oriented partners design and implement powerful learning experiences and forward-leaning strategies, and thought leadership campaigns. Learn more about how we can help you extend your impact. Stay in-the-know with all things edtech and innovations in learning by signing up to receive our weekly newsletter, Smart Update. This post includes mentions of a Getting Smart partner. For a full list of partners, affiliate organizations and all other disclosures, please see our Partner page. We loved our progressive experience at Pine Street School in NYC. Check them out!